Jaen castle is one of the most unique that we have visited, if only for the fact that it now houses the finest parador in Spain. 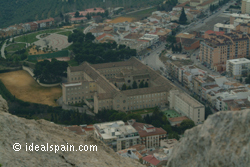 The Castillo de Santa Catalina sits high above the city of Jaen, from which point you can obtain magnificent views. 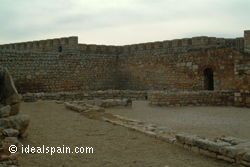 The site is that of an 8th century Arabic fortress of huge proportions but most of the building was rebuilt after the conquest of Jaen in 1246. Many of the castle's defensive elements were thoughtlessly destroyed when the parador was built in 1965. Through the history of the fortress, there have been many changes, most importantly: 13th-15th century when the main construction of the fortress took place. 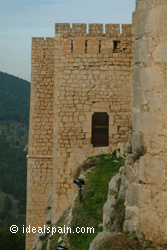 Six towers and sections of wall were built which constituted the basic framework for the castle. During the 17th century the whole interior of the castle was remodelled with extensive work on the Portillo in the southern wall which had fallen into disuse. At the beginning of the 19th century the Napoleonic troops also made changes. The castle is accessed by a tarmac road that winds round the hill. This is the same access that has been used for centuries. Once at the top there is limited parking. Entrance to the castle is 3€ at the time of writing and it is a pleasant wander around the grounds. Views can be had from every angle and you can see for miles. The castle has now been totally restored and is open to the public - entrance charge is just 3 euros per person. There are ample information boards in several languages, explaining the different rooms.